Comprehensive biography delivers everything you wanted to know about the rise and fall of an influential writer. Despite being well respected in France and attaining cult status in America, Ted Lewis is largely forgotten in his native Britain. Author of nine novels, his legacy today largely rests on the move adaptation of Jack’s Return Home, filmed as Get Carter. Fusing techniques borrowed from the hard-boiled American crime fiction with social realism he founded a new school of British crime writing. Continuing to exert a strong influence on contemporary fiction, echoes of his most famous work can be found in Jake Arnott’s underworld novels, Stuart Neville’s The Ghosts of Belfast, David Peace’s Red Riding trilogy, and Shane Meadows’ film Dead Man Shoes. Notable fans of the author include Derek Raymond, James Sallis, Max Allan Collins, Ben Myers, and Cathi Unsworth. In life and death, the author drifted into relative obscurity and his most famous work has been obscured by the better-known Michael Caine starring film version. Despite being championed by a small but dedicated group of admirers greater acclaim continues to elude Lewis and his work. Currently, most of his novels are out of print in print in the UK. For decades Ted Lewis was one of the most significant British crime authors most people had never read. Nick Triplow’s meticulously researched biography is the definitive account of Lewis’ life and his work’s continued relevance. The book is a nuanced study of a tortured soul that is as compelling and rich as anything written by Lewis. Equal parts social document and crime fiction, the best of Lewis’ novels attempted to stretch the parameters of what it was possible to achieve within the confines of British crime fiction. Defined in the popular consciousness by the Mike Hodges directed film Get Carter, Triplow reveals that the adaptation was largely ignored or misunderstood until undergoing rediscovery and rehabilitation in the 1990s courtesy of Loaded magazine’s aborted attempt to publish a comic-strip version. Triplow suggests that Crime Time‘s publication of a Lewis retrospective issue in 1997 alongside the screening of a restored Get Carter at the National Film Theatre momentarily placed the author, or more specifically his most commercially successful work, in the new laddism zeitgeist. It was particularly apt that the book and film were reappraised in the dying days of Britpop having previously been recognised as signalling the end of the 1960s. Interviewing school friends, university classmates, work colleagues, drinking pals, and fellow writers Triplow examines possible causes of Lewis’ self-destructive behaviour and his excessive drinking. Discussing Lewis’ literary output in relation to his life Triplow reveals that the author frequently transposed real events, people, and places into his work. The experience of being tormented by a sadistic headmaster was retold in Lewis’ 1975 novel The Rabbit. Gangsters met in Soho drinking clubs inspired characters and events in Get Carter and subsequently written crime novels and TV scripts. Getting Carter is an impressive study that shatters numerous half-truths and myths about Lewis that have circulated since his death. Triplow skilfully recreates a long lost era enabling the reader to momentarily walk in Lewis’ path and understand why he stood apart from other crime writers. Is “Out of Thin Air” the next “Making a Murderer”? Did six innocent people confess to a murder they didn’t commit? Why has the case remained unsolved? A new documentary sheds light on the investigation. On the night of January 26th, 1974 Gudmundur Einarsson, an 18-year-old labourer, went to a dance hall in Hafnarfjordur, a port town 10km south of Reykjavik. When the venue closed at two in the morning he attempted to trek home despite the harsh winds and heavy snow. Two girls driving through the town claimed to have seen Gudmundur and an aggressive drunk attempting to hitchhike. Later that morning Gudmundur was spotted trying to make his way home alone through the thick snow. According to a witness report, he was heavily intoxicated and fell in front of an oncoming car. This would be the last known sighting of Gudmundur. When Gudmundur failed to turn up for work he was reported missing. Not suspecting foul play, the police conducted a thorough search. Unable to find any trace of Gudmundur’s whereabouts the file was closed after two weeks pending further evidence. Ten months later Geirfinnur Einarsson (no relation), a 32 year old digger-driver, returned home from work. A colleague had invited him to go and see a film at the local cinema. Geirfinnur declined the offer, claiming he had to be meet someone later that night. The colleague drove Geirfinnur to a nearby cafe where he bought a packet of cigarettes. Returning home he answered the phone and was heard by his wife saying “I’ve been there already. I’ll be there”. He went out again, drove his car and parked near to the cafe. Geirfinnur was last seen in a phone booth. The keys were left in his car’s ignition waiting for a driver who would never return. Six petty criminals known to the police for alcohol and drug smuggling became prime suspects in the investigation. Initially denying any involvement all six would confess to their involvement in a double murder after being broken by lengthy interrogations, repeated bouts of torture and extended periods of solitary confinement. Attempts to withdraw the statements were dismissed by the Supreme Court. To date the police have found no physical evidence of murder. Halfway through the investigation an embattled government facing a toxic cocktail of the Cod War and a general strike enlisted the services of German “super cop” Karl Schutz to oversee the investigation. Employing a more forceful style of interrogation Schutz extracted fresh confessions that enabled all six to be found guilty for their part in a double murder. New documentary Out of Thin Air picks up the case and shines a light on this enthralling, enraging, and perplexing tragedy. A real-life Nordic Noir for crime fans yearning to watch something new after Making a Murderer, The Keepers, and The Jinx. Quentin Bates’ chapter in Truly Criminal: A Crime Writers’ Association Anthology of True Crime provides an exhaustive overview of this case and its continued relevance. A 2014 BBC World Service documentary interviewed the surviving suspects. Author EuroButNotTrashPosted on May 19, 2017 May 19, 2017 Categories Crime Non Fiction, Icelandic TVTags Geirfinnur Einarsson, Gudmundur Einarsson, Icelandic Film Centre, Mosaic Films, Sagafilm1 Comment on Is “Out of Thin Air” the next “Making a Murderer”? Despite being a folk hero in his native country, the criminal exploits of Jacques Mesrine were largely unknown in the UK until the release of a two-part feature film directed by Jean-François Richet and starring Vincent Cassell. Famed for a succession of bank robberies and audacious escapes from prison. To the public, he was a Robin Hood figure striking a blow against a corrupt and unjust system. For the police, Mesrine was a gangster that had to be put back behind bars. By the 1970s he had become the most wanted criminal in France and Canada. Media savvy, Mesrine recognised the importance of positive press coverage in an age before spin became a buzzword. A succession of Paris Match cover appearances and interviews perpetuated an airbrushed account of his methods and motives. A memoir containing gruesome details of killings ensured Mesrine was in total control of his myth’s creation. Written while incarcerated in La Santé Prison. He surreptitiously found a publisher willing to print the book and managed to smuggle the manuscript out of the institution. The book was an instant best-seller. Seeking to quash the cult of Mesrine and prevent further distribution of the text, profits were confiscated by the state. With the book no longer viable from a commercial standpoint the authorities were convinced this literary endeavour would be swiftly forgotten. They hadn’t banked on curious would-be readers keen to get their hands on a copy after hearing positive comments about the book. To meet initial demand a small number of bootleg copies were clandestinely distributed. Mesrine’s life was cut short in 1979 when a van drove up beside his car and four armed police officers opened fire on the vehicle. His family maintains the shots were fired without warning but a 2004 court hearing ruled that the officers had interpreted Mesrine’s movements as potentially reaching for a weapon and had acted in accordance with the law. After Mesrine’s death interest from the public in the all aspects of his criminal career and political leanings was at fever pitch. 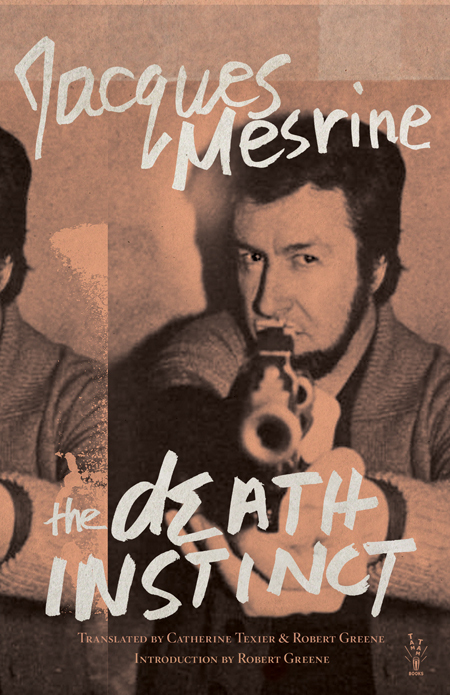 Catering to the seemingly insatiable appetite for information about the fallen gangster’s life a publisher reissued Mesrine’s memoir. The reprinting was met by a legal action brought upon the publisher by Mesrine’s family. Seeking to reclaim confiscated royalties, the estate successfully mounted a challenge that saw the entire print run seized and outstanding author’s payments repatriated. In 1984 Situationist publisher éditions Champ libre re-issued the book. Owner, editor, and publisher Gérard Lebovici was murdered shortly after the book hit the shelves. His killer remains at large. Long out of print and never before available in an English language edition. Tam Tam Press’ issuing of a newly translated edition reveals that Mesrine had potential to forge a career as a full-time writer if he’d he not sought a life of criminality. Equal parts autobiography and socio-political tract. The author sketches a narrative of key stages in his descent into a life filled with feuds, scams, and murder without remorse or excessive self-analysis. As a child, Mesrine frequently absconded from school to watch Westerns and Film Noirs at a local cinema. The legacy of those afternoons spent watching those films seeps through every page. Structured like a thriller, the book presents instances of brutality with shockingly vivid detail. More than a true crime book, The Death Instinct offers an insight into the mind of a psychopath. With every sentence, Mesrine is attempting to manipulate the reader and control their views of his actions and get them to subscribe to his political agenda. The most significant literary account of a criminal’s life to have been published since Edward Bunker’s Mr Blue: Memoirs of a Renegade. The Death Instinct is published by Tam Tam Books. One of the UK’s foremost experts on crime fiction, Barry Forshaw’s knowledge of the genre is without equal. In addition to editing Crime Time and Nordic Noir magazines, he is the author of several notable books including Death in a Cold Climate: A Guide to Scandinavian Crime Fiction and British Crime Film. Regularly called upon to appear in documentaries, it was whilst working on Italian Noir for BBC Four he was struck with inspiration and came up with the idea for what eventually became Euro Noir. A companion to last year’s Nordic Noir (also published by Pocket Essentials), this latest volume has a far broader remit. Endeavouring to survey as many contemporary authors working in the field across the continent as possible, Barry Forshaw proves that the distinction between fan and media professional is an arbitrary one. Written with an infectious enthusiasm and drawing from many years devouring the cream of what our cousins from the mainland have to offer, the author presents a near-definitive guide to Europe’s take on the genre. Long-term readers of Barry Forshaw’s work will know that his hallmark is the ability to appeal to newcomers seeking a thorough overview before making their own tentative steps into the nearest bookshop, public library, or DVD store and yet still offering something that will force long-term enthusiasts to rethink any assumptions they may have about an author, book, film, or movement. Offering a refreshing new take on the genre and its attendant criticism, the author’s trademark thorough research is taken into an entirely different realm by the addition of interview extracts with authors, translators, and editors. Personal anecdotes of meeting writers and publishing staff at festivals or institutes lift this text so that it never becomes a dry analysis. An exuberant critical celebration, subtitled The Pocket Essential Guide to European Crime Fiction, Film &TV the book covers an immense number of titles and is written so that even those who have seen a specific film or read a particular book several times will want to go back and experience the story all over again to see how whatever nugget of information the author has offered changes the viewing or reading dynamic. A key plot or character moment may be totally transformed after reading what the writer wanted to convey or perhaps a cultural cue explained by Barry Forshaw might add layers of rich texture to a scene. A justly deserved reputation for cogent arguments and an inclusive approach to the material being scrutinized was validated when the book was selected as a university set text whilst still in the proof stages. An essential guide not only to crime fiction but also a celebration of European popular culture. The overview has a slight bias towards the west not out of any personal preference but because of the availability of translated editions. Euro Noir is encyclopedic in scope and is written to be accessible, titles cited can be ordered from any major retailer. Traversing the continent’s rich contribution to the genre of crime fiction Barry Forshaw doesn’t discriminate, authors less known to UK readers and more famous names are given an equal amount of coverage and analysis. From Georges Simenon through to Jakob Arjouni and Marek Krajewski, the figures vital to the foundation and expansion of European noir are profiled and their most representative works given the accord they deserve. Alongside the consideration of the literary scene is a fully comprehensive overview of essential films and TV series that includes modern cult classics Braquo, Mesrine, Salamander, and Spiral but also covers older works including Les diaboliques, and Lucky Luciano. Crime fiction is an ever-expanding genre. In the year since Nordic Noir was published fans have been treated to a number of new authors along with a succession of high-quality series brought to us courtesy of BBC 4, More 4, and Arrow Video. The author revisits Scandinavia’s contribution in a chapter that brings readers bang-up-to-date with what is happening in the Nordic territories. Entertaining, illuminating, and indispensable. This is the ultimate road map for anybody interested in European crime books, film, and TV. Euro Noir is published by Pocket Essentials. Further evidence of the sub genre’s absorption into the mainstream was provided by a screening of the final episode of Borgen‘s second season at the Edinburgh Playhouse accompanied by a question and answer session with the lead actor. The event proved to be more popular than was initially anticipated, leading to further sessions being arranged to cater for those who wanted to attend the event but thought they might not be able to due initial plans for a single event underestimating the high number of fans that were willing to travel great distances for the experience of seeing an episode on the big screen, quizzing a member of the cast, and finally meeting those with whom they’ve celebrated and debated the series on Twitter or Facebook. This fan gathering generated a surprisingly level of coverage from media organizations. In a break from an already overloaded schedule fielding questions from enthusiasts, accepting an absolutely amazing fan made calendar, and holding a brief private audience with a prominent Scottish politician Sidse Babett Knudsen was invited by the BBC and Sky to appear on news programmes. No doubt feeling validated that the event in Edinburgh was successful in terms of promoting the show, Nordic Noir as a brand, and its accompanying fandom Arrow Films capitalized on both the attendant media coverage and its core customer base feeling bereft after relatively recent season finales of The Killing and Borgen by releasing Above the Street, Below the Water. Using this particular title, alongside Unit One, to kick start what promises to be a thoroughly rewarding year in terms of new productions and the distribution of those shows which might otherwise have slipped under the radar is both an award to long term fans that have followed this range since its emergence a few years ago and a play upon the theme of spectatorship that is very cleverly woven into the script’s spine. Fans who have remained loyal to Nordic Noir, both as a subgenre and brand, finally have the opportunity to buy a movie which invites the viewers to draw from their stored knowledge of Scandinavian film and TV series and engage in the activity of “actor spotting”. The discovery of archival content which had previously not been made available in the UK and its subsequent distribution has been central to the formation and maintenance of several fandoms. Autobiographical and ethnographic accounts from members of a number of musical subcultures including Northern Soul and Rockabilly have suggested that in the group’s embryonic stages the recovery, exhibition, and rehabilitation of previously unavailable items ranked equal in importance to the consumption of new material as it enabled fans to engage in critical dialogue with each other thereby assisting in the formation of group identity and facilitating participants being able to establish a provisional consensus regarding generic parameters. Whilst Nordic Noir already existed as discrete cinematic, televisual and literary forms long before UK audiences were first exposed to Jo Nesbo, The Killing and Yellow Bird’s adaptation of Larsson’s Millennium trilogy, obtaining information of the key developments within the movement has until now been compromised by insufficient data being made available to English speaking readers about titles that whilst hugely influential within a Scandinavian context have not been distributed in other territories. 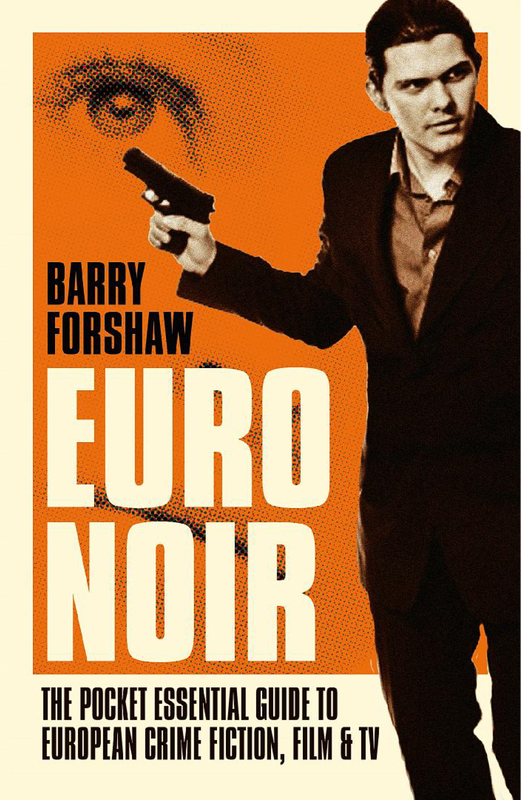 The publication of Barry Forshaw’s Nordic Noir represents the first attempt by a mainstream imprint to provide a historical and critical overview of the sub genre’s antecedents, cultural influences, political subtexts, gender representations, and possible explanations for the phenomenal sales figures which have repeatedly defied industry expectations. Subtitled The Pocket Essential Guide To Scandinavian Crime Fiction, Film & TV, this is a comprehensive work of reference that aficionados will return to repeatedly in order to enhance their knowledge of a particular book, author, film or TV show. In the introductory section, Forshaw addresses with refreshing honesty the problematic notion of being designated as an expert in any given field, how he has acquired his knowledge and what he wants readers to do with the information in the book. As a long time editor of Crime Time and author of several non fiction titles, including a sterling biography of Steig Larsson, Forshaw has been acquainted with Scandivian fiction for several decades. The roles of media professional and fan are not mutually exclusive and throughout the text Forshaw writes as an enthusiast keen to share his discoveries in the hope that readers might feel sufficiently enticed to order some of the tiles he has recommended. As this remarkable example of scholarship reminds us, Nordic Noir didn’t arrive on our shores as a fully formed sub generic movement. The earliest titles available to UK readers were appreciated as competently written crime novels and possibly early critical commentary may have primarily focused on the left leaning political subtext that was prevalent in those books. Scandinavian fiction, as a marketing brand, didn’t exist back then and titles were lumped in with other foreign authors but received less critical praise or sales figures that were awarded to, for instance, Georges Simenon. Intriguingly, Forshaw’s historical overview references authors and stylistic approaches which were prevalent before Sjöwall and Wahlöö embarked on their influential ten book series. Wherever possible the author enhances his analysis with appropriate use of interview extracts culled from his many years of researching and writing about crime fiction. This enables the reader to become better acquainted with the cited writer’s working methods, life history, and individual approaches to the movement. With regards individual authors, Larsson, Nesbo, Sjöwall and Wahlöö are the big hitters in terms of sales and influence and whilst they are accorded the greatest scrutiny Forshaw’s encompassing and celebratory investigation references many lesser known writers. That a free to air broadcaster would regularly devote two hours each Saturday evening for the screening of a foreign language series would once upon a time have been classed as ratings suicide and yet BBC4 has shown that imported subtitled content can be viable in terms of audience viewing figures and the appreciation index. Similarly, Arrow Films DVD range has been successful enough to warrant the licensing of several titles not currently scheduled for UK TV transmission and has also been awarded with a vibrant and critically aware online fan community. This is essentially a second wave of Nordic Noir that feeds from and back into the literary strand. Several notable films and TV series are analysed by Forshaw, including, but not exclusively, Borgen, The Killing, Wallander. An appreciation of these series is balanced with behind the scenes information some of which may surprise even the most knowledgeable of aficionados. One thing the book does incredibly well is to draw attention to generic inflexions or cultural cues that the reader might have missed out on when they last read a specific book or watched a particular film and TV series. Armed with this new information the reader might want to go back and devour these titles all over again but with an enhanced perspective. Closing with a section on names to watch out for over the coming months and years one can’t help but wish for this excellent text to be updated at regular intervals so as to accommodate new perspectives on the subgenre that occur following the release of each book or DVD from Arrow Films. Nordic Noir – The Pocket Essential Guide To Scandinavian Crime Fiction, Film & TV is published by Pocket Essentials.